Starting with the fresh aroma of pure cranberries, this tea is joy in a cup. Visually, the orange-hued safflowers contrast beautifully against the dark leaf. This fruit-forward, medium-bodied blend is a medley of sweet-tart fruit with a solid black tea base. 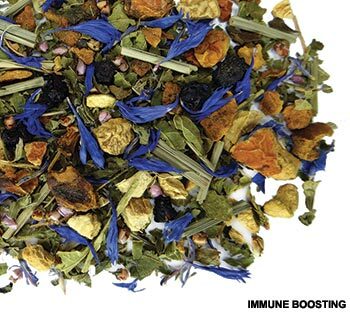 This lively cup is fragrant and full of fruit. The black tea offers a mellow mouthfeel and ripe berry notes linger at the finish. Try Cranberry Orange Black Tea iced — double the amount of tea leaf and brew two minutes longer. Then pour over ice and enjoy! Add a splash of lemonade or sparkling water with fresh cranberries for a summertime cooler. Serve this black tea blend with freshly-baked scones, cream and a bit of berry jam to extend the berry notes. It pairs perfectly with buttery desserts like berry crumble and spiced coffee cake. 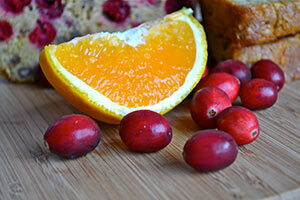 The classic combination of cranberries and orange shines in desserts, relish and even savory dishes. Add a bit of brewed Cranberry Orange Black Tea to your next recipe in place of water or other liquid.